Matt began playing golf in Ohio when he was just two years old. He developed the love for not only playing the game, but everything it attracts - the golf courses themselves as well as the overall life themes that come along with striving to be your best. After a competitive junior career, Matt attended the Golf Academy of America in Myrtle Beach, SC. It was at the Academy that he put to use the passion he had felt for the game all these years. Matt loves spending time with his students to improve their golf games, but his true passion is people and learning from each and every interaction. Matt has spent hundreds of hours with top 100 teachers throughout his career; he believes in using pieces from every instructor to mold his own idea of how to see rapid improvement in each and every student. 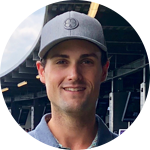 Whether students want to begin with a solid foundation in golf swing fundamentals, increase confidence in their own ability, or anything in between, Matt is eager to help any student play at his or her best.